The current exhibit in the Clarke Historical Library, “The Presidency” will close on Monday, January 28th. 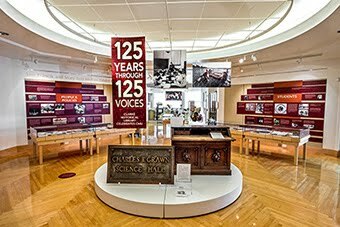 If you have been putting off visiting to see the collection of political cartoons, presidential campaign biographies, and the wonderful collection of autographs signed by each of the 43 American presidents, which is on loan to the Library, this weekend will be your last chance. Drop by weekdays from 8:00 am until 5:00 pm or this Saturday from 9:00 am until 1:00 pm.